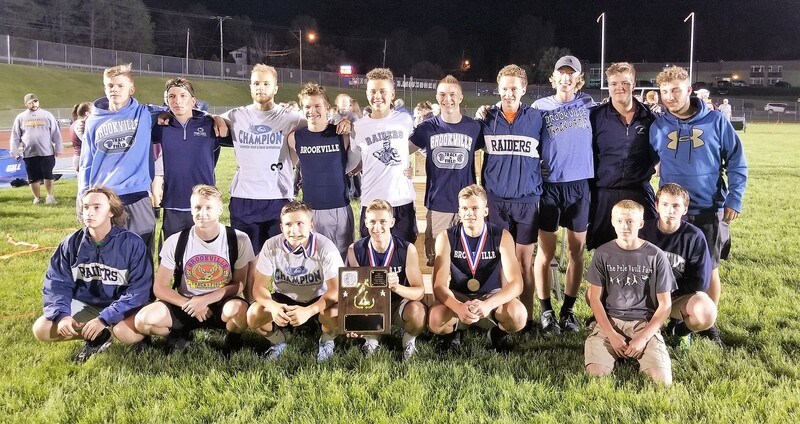 BROOKVILLE, Pa. – Riding a pair of individual champions and a pair of relay champions, Brookville took home its second straight District 9 Class 2A boys’ track and field championship Friday at Brookville High School. Brookville finished with 115.16 points well ahead of second-place finisher Elk County Catholic, who had 60 points. Moniteau was third with 54 points and Clarion fourth with 53. Ian Thrush picked up three gold medals for the Raiders winning the 100-meter dash in a time of 11.31 seconds and taking home two relay titles. He was a member of the winning 4×100-meter relay squad (43:19) and the 4×400-meter relay team (3:26.92). He was joined on the 4×100 by Jack Krug, Bryan Dworek and John Frank and on the 4×400 by Dillon Olson, Krug and Frank. Thrush also finished second in the 200-meter dash (22.34). Thrush talked about his victory in the 100 making him the fastest 2A boy in D9. Dworek won the long jump (21-5 ½) and was third in the 200 (23.00). De-Angelo Coffey qualified for the PIAA meet in two events with second-place finishes taking second in the high jump (6-0) and the long jump (21-3 ¾) while just missing out in the triple jump finishing third. Brendan Zerfoss of Clarion won the James Manner Award as the meet’s MVP winning the 200-meter dash (22.27) and the 400-meter dash (50.28) while taking second in the 100 (11.42) – he reportedly will scratch in the 100 at the PIAA meet opening the way for Elk County Catholic’s Jacob Kloss (11.43) to go to the PIAA meet in the event. Zerfoss talked about winning the 400. Moniteau’s Jacob Patton took home titles in both hurdles winning the 110-meter hurdles in a time of 15.53 and the 300-meter hurdles in a time of 39.68. Patton’s Warriors teammate James Parenti won the discus with a throw of 158-feet, while Clarion-Limestone’s Riley Hummell took home the javelin title with a throw of 182-5. Hummell talked about his title. Kane’s Bailey Blint won the shot put with a throw of 51-2 ¾ with his Wolves teammate Teddy Race winning the pole vault with a vault of 13-feet. Keystone’s Brody Coleman won the triple jump with a leap of 43-10 and was second in the 300 hurdles in a time of 40.33. Redbank Valley’s Sam Hetrick took home the championship in the high jump (6-2). He talked about his title. Smethport’s’ Christian Tanner won the 800-meter run (1:58.74), ECC’s Matthew Dippold took home the 1,600-meter run in a time of 4:34.48 and ECC’s Ben Hoffman won the 3,200-meter run in a time of 9:56.14. Ben Hoffman was also on the winning 4×800-meter relay team that also consisted of Logan Hoffman, Jacob Carnovale and Dippold. Dippold was also a member of the second-place 4×400-meter relay team that included John Wittman, Logan Hoffman and Jacob Koss that ran a time of 3:30.70. Ben Hoffman talked about his meet. In addition to the 300 hurdles, the discus also had more than two qualifiers. Drew Kilhoffer of Johnsonburg took second with a throw of 156-4, Blint was third (152-10) and St. Marys Adam Park was fourth (152-0). Additional second-place finishers not already mentioned that are PIAA qualifiers are Hunter Jones of Karns City in the 400 (50.74), DuBois Central Catholic’s Linkin Nichols in the 800 (2:00.06), Smethport’s Darion Gregory in the 3,200 (10:00.73), St. Marys’ Anthony Cortina, who tied Coffey in the high jump (6-0), Moniteau’s Kyle Norling in the pole vault (12-6), Otto-Eldred’s Jesse Bennett in the triple jump (43-2 ¾), Johnsonburg’s Max Cowan in the shot put (49-3 3/4 ) and Otto-Eldred’s Dylan Close in the javelin (180-1). 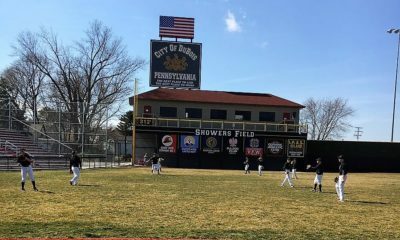 The Johnsonburg 4×100-meter relay team of Alec McManus, Aaron Hinton, Andrew Breier and Aaron Pura also qualified for the PIAA’s by taking second in a time of 44.38 and the Smethport 4×800-meter relay team qualified with a second-place finish in a time of 8:19.48. Christian Tanner, Darion Gregory, Eric Szarowicz and Jordan Pavlock made up that squad.